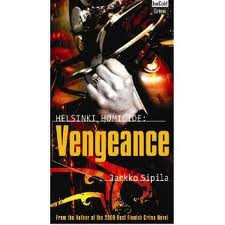 Jarkko Sipila's Helsinki Homicide series (the new volume's title is Helsinki Homicide: Vengeance) is traditional noir in a lot of ways. The style of the writing is very direct, mixing dialogue and narration in about equal parts. That's a significant fact for Vengeance, which reminds me in some ways of the biker-gang novels of Canadian crime writer John McFetridge, except that McFetridge moves the story forward almost entirely via dialogue (and the Canadian writer's wit is frequently in evidence, whereas the humor in Sipila's books is very dry, in a laconic, somehow Finnish style). Sipila's main character, Suhonen, an undercover cop, sets things in motion simply by seeing a suspicious driver, whom he follows. The driver meets a Russian-Estonian whom Suhonen discovers has ties to drug trafficking between Estonia and Finland, but the plot twists away from that revelation toward the just-released-from-prison leader of the Skulls biker gang, Tapani Larsson, who bears a grudge against Suhonen. For me, the book began to pick up speed and to compel my interest as the character of Salmela becomes more important. Salmela is a low-life, brain-injured former prison inmate, as well as childhood friend of Suhonen. Salmela's attempt to do one drug deal to provide enough cash to get him out of the criminal life pulls him into the Skulls' orbit and a dangerous assignment from the police. Sipila avoids cliches throughout: as Salmela spirals downward, his story never takes the obvious turn, and as his situation becomes more desperate, the tale tightens and compels the reader (this reader anyway) forward. Looking back at the first Sipila novel to be translated, which I reviewed here in a rather lukewarm fashion, I like the series more than I indicated then. I mentioned the link to McFetridge, and in the earlier review I mentioned a similarity to Elmore Leonard's casual, realistic plotting as well as to the Jim Thompson school of noir. 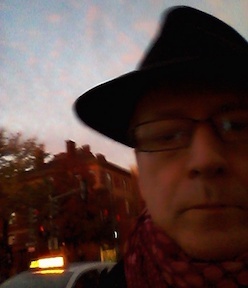 What I realize now is that Sipila's style is naturalism. He doesn't strain for effects or play up his hero as a flashy crime fighter. When Suhonen and Salmela are stranded in a tight spot, the outcome isn't determined by flashy martial arts skills or mind-bending feats of detection (or mind-stretching coincidences0 but by a very ordinary aspect of modern life. Sipila is giving a straightforward and believable portrait of conflict in the streets of Helsinki, and giving a gritty portrait of the city as well as a truly noir reading experience along the way.